[mantra-multi][mantra-column width=”3/4″]The Fairytale Tarot is based on traditional fairy stories from around the world. The cards draw on an exceptionally rich collection of stories, so the deck is powerful for readings and offers many-layered interpretations. Each fairytale is summarised in the book for ease of reference. 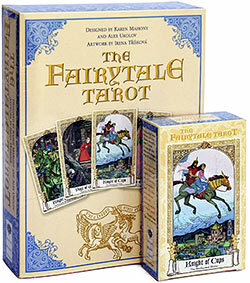 It’s proved to be a very popular deck not only for use as a tarot (it follows the RWS structure) but also as a deck for story-telling, daily-draws and oracle use. The separate deck is now sold out and will probably not be reprinted. We do still have a few companion books available on our shop HERE.